Who do আপনি like better with Bloom??? Do u think Layla/Aisha and roy is perfect then Layla/Aisha and nabu?? Do u think Helia really প্রণয় crystal? Do u think sky is getting away from bloom? So it has been a long time that I haven't made a story. I guess I don't have the inspiration, just in few rare cases and this is one of them. This story is mostly about Flora and Helia. And since now I বিজ্ঞাপন everyone of আপনি who reads the story, it can have pretty bad grammar but since I প্রণয় to write I keep doing it. My last story wasn't pretty bad though, one of the parts is শীর্ষ rated #3. At Amazonia Diana(Fairy of nature, appears season 4): OOh no... It can't be true. She is alive!! Stella: What is it funny about being trapped and kidnapped দ্বারা your living plants? Stella: It is a big deal!! Flora walked up to the gates of Alfea. Her সেকেন্ড বছর and still no প্রণয় life. She sighed and walked through the gates....Again. "FLORA! I missed you!" She calmed down realizing it was Bloom. " "no," And then perked up again. "I heard about a new boy in RF!! Your time has come Flo,TO BE LOVED!" Bloom shrieked. Bloom was born on the planet Sparks to King Oritel and কুইন Miriam. Shortly after birth, her planet was attacked দ্বারা a coven of witches (the Trix's ancestors) who sought to retrieve the Dragon's Flame from Sparks.During this battle, the lively culture and population was decimated. In a final sacrificial act to ensure that the Dragon's Flame did not fall into the wrong hands, Bloom's older sister, Daphne, sent her into a portal that led to another planet, Earth. At the beginning of season one, Bloom was 16 years old. a poll যুক্ত হয়ে ছিল: Who do আপনি like better with Bloom??? an answer was added to this question: Do u think Helia really love crystal? an answer was added to this question: Do u think Layla/Aisha and roy is perfect then Layla/Aisha and nabu?? 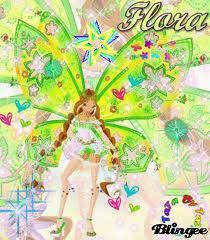 What kind of fairy is Flora?